Long gone are Physical Activity Course (PAC) Program instructor Cressey Merrill’s days of traveling to Eugene and then hauling his student’s equipment in the bed of his pickup truck for the trip back to OSU. Thanks to a partnership and support by the College of Public Health and Human Sciences (CPHHS) and the Research Office, the OSU Academic and Recreational Dive Center (ARDC) officially opens on October 14, 2016, with an open house. PAC, part of the CPHHS, funded the construction and renovation of the center, and secured additional funding for new equipment. The Research Office funded the compressor and fill stations. Both programs share the equipment and the space, creating a valuable collaboration. 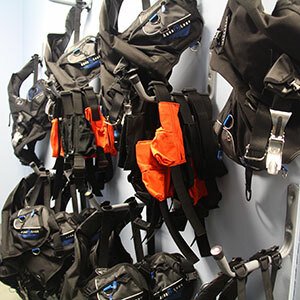 Take a walk through the dive center and you’ll see how things have come full circle for instructors and their students. 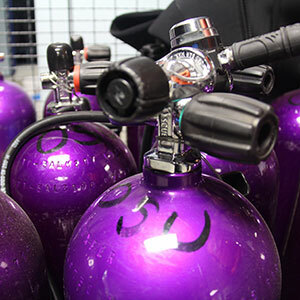 Students meet their instructor on the pool deck and then walk through one of the locker’s doors to grab their regulator and buoyancy control device. They then walk into an adjacent room to get their tank and meet back on the pool deck. PAC scuba courses are a prerequisite for anyone interested in conducting scientific research. They can also be taken by any student interested in becoming a certified scuba diver. The certification process involves an academic, pool and open water section. An average of 250 students take a scuba class each year. OSU is one of three scientific diving facilities in Oregon recognized by the American Academy of Underwater Sciences (AAUS) and is leading the way in preparing students for careers involving scientific diving. Diving at OSU has experienced substantial growth over recent years, and Diving and Small Boat Safety Officer Kevin Buch says the timing of the new dive center is perfect. “We are extremely grateful to receive this funding to invest in Oregon’s next generation of recreational and scientific divers,” Kevin says. He adds that the new dive center will allow OSU to adequately train and prepare more scientific diving students, will be better able to support research diving activities, and will be better placed to handle the growth associated with the new Marine Studies Initiative. Instead of juggling equipment, Cressey can now focus on teaching. He used to go home after class to rinse wetsuits. Now, he uses the hoses at the pool and hangs them to dry in the locker. He used to fill tanks with an air compressor that caused his electric bill to soar. Now, he fills them quickly with ease on the fill panel. He says the best part of the new scuba facility is that his students receive more instructional time. The new dive center also provides students with comfort and familiarity, a vital component when scuba diving. Safety is now in the hands of the instructors, and equipment can be serviced quickly. Cressey says that owning the equipment permits instructors to service the equipment if deemed unsafe. Previously, without legal right to the equipment, it had to be serviced through a third party at designated times. The new equipment will certify hundreds of divers each year, either for recreation or to conduct scientific research. Cressey has taught students planning to go into marine biology and zoology, those who love the ocean and are interested in diving for fun ­– and even those who are afraid of the water or can’t swim. After 18 years of instructing students, Cressey says the most satisfying part of his job is witnessing a student who was hesitant come out from a dive ecstatic.